Last week we began talking about the power of appreciation and its ability to energetically transform our lives and bring to us all that we desire. This week, I want to give you a powerful exercise that I promise will transform your relationship with yourself and transform the way you see the world and how the Universe responds to you. It’s very simple. Write down what you are grateful for. Gratitude and appreciation are the same energy and by leveraging that energy, the Universe has no choice but to respond in your favor. 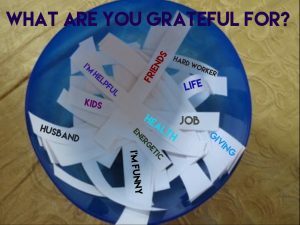 First, create a gratitude bowl. Take little slips of paper and on each one write “What I appreciate about me is….” Again, they don’t have to be major things, just something that you appreciate about yourself. The more you do it, the easier it becomes. Put the slips of paper in the bowl and place it next to your bed. Each morning, pull out one of the slips of paper and for at least 17 seconds, focus on it. Feel the appreciation for yourself. You can work up to two minutes which is ideal, but even 17 seconds, the time it takes to take a deep breath, will shift your thoughts, attitudes and beliefs, because for that time it has shifted your now moment. The more we appreciate ourselves, the more we radiate out that energy. The Law of Appreciation and the Law of Attraction go hand in hand because the energy you send from your tuning fork, even if it misses your intended target will hit something and will attract that same energy back to you. When this begins to happen, watch out, because things will start coming to you quickly! In the spiritual realm, there is the law of demand and supply, rather than the economic law of supply and demand. Spiritually, before substance can manifest, a need or desire must first be expressed. The request comes first, the demonstration second. If you do not ask, it’s difficult to receive. So – You must identify what you want. And then be open to receive it. Many people have a block to receiving, but it’s your birthright. You deserve to have your dream house, a loving and supportive partner, a job that feeds your soul and passion and pays you what you desire. Go forth and claim it! But, this is a crucial step – Don’t look for it and say, “It’s not here yet”. “I asked for my dream house, but I don’t have it yet”. “I put out into the Universe that I want a loving partner. Where is he?” That changes the energy and you are back at the beginning. Keep your thoughts on your tuning fork. What energy are you putting out in EACH MOMENT? If you ask for it and then focus on it not being here, you are telling the Universe you don’t have it. The trick is to demand it from the Universe and then let it go, knowing that it is already done. Trust and allow and don’t ask how. If you want a loving partner, become the partner you want. Trust me, when you begin to appreciate yourself, your inner light will shine brightly and you will have suitors lined up. Next week we will delve further into the levels of appreciation. Physical, mental, emotional and spiritual and learn how to harness that collective energy towards the life of our dreams!